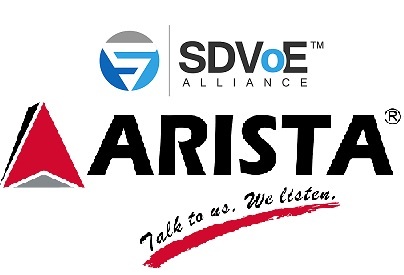 Fremont CA, USA- February 9, 2017 Arista Corporation, designer and manufacturer of AV signal distribution and switching products, has announced its association with the Software Defined Video over Ethernet (SDVoE) Alliance. Arista’s upcoming IP FlashCaster utilizes SDVoE technology to deliver uncompressed AV signals over 10GbE Ethernet networks which offers the possibility to create dramatic new architecture and intuitive user experience. All AV distribution applications that demand zero-latency and uncompromised video quality can benefit from AV-over-IP technology standards set by SDVoE Alliance. The SDVoE Alliance is a nonprofit consortium of technology providers collaborating to standardize the adoption of Ethernet to transport AV signals in professional AV environments, and create an ecosystem around SDVoE technology allowing software to define AV applications. “We are foreseeing this new technology trend moving towards the main market stream and soon to dominate the market,” Paul Shu, President, Arista Corporation. SDVoE Alliance creates an ecosystem around AV-over-IP technology and facilitates true AV/IT convergence; allowing high quality AV and data networks to share a single infrastructure based on off-the-shelf Ethernet switches. This substantially lowers cost and delivers greater system flexibility over traditional approaches. Uncompressed and zero-latency AV-over-IP is the future of AV signal distribution. Arista rides on this new technology trend with their upcoming IP FlashCaster, developed to change the dynamics of the Pro AV industry. IP FlashCaster allows installers and OEMs replace their proprietary AV matrix switches with off-the-shelf Ethernet networks. Moreover, it is designed specifically to deliver dramatically better performance, flexibility, and scalability. IP FlashCaster is cost-effective and delivers end-to-end systems for AV and KVM signal extension, IP-based switching, video wall and multi-view applications. IP FlashCaster also provides unique support for HDMI 2.0, HDR, high-fidelity video scaling, windowing and audio downmixing. Founded in 1994 and headquartered in Fremont, CA. Arista Corporation is committed to the highest standards of product development, engineering, manufacturing and customer support. With a strong legacy of successful professional AV connectivity solutions, Arista offers extensive range including extenders, splitters, switchers, multi-viewers and much more. To know more visit www.goarista.com or email sales@goarista.com. About SDVoE Alliance: SDVoE is an initialism for “Software Defined Video over Ethernet”. The SDVoE Alliance is a nonprofit consortium of technology providers collaborating to standardize the adoption of Ethernet to transport AV signals in professional AV environments and to create an ecosystem around SDVoE technology allowing software to define AV applications. Founding members of the SDVoE Alliance are AptoVision, Aquantia, Christie Digital, NETGEAR, Sony and ZeeVee. SDVoE Alliance founding members bring different perspectives to the SDVoE initiative spanning the entire ecosystem with expertise in chipsets (AptoVision, Aquantia), switches and storage (NETGEAR) and AV end points (Christie Digital, Sony and ZeeVee).